Word Tower has reached one million plays. Assuming an average of say, 5 minutes a game, that’s more than nine and a half years of time used. Perhaps someone given 9.5 years could come up with a nice programming language or maybe created a whole new game. Instead they’ve been placing letters to climb up a little tower, maybe repeatedly. Awesomesauce. Here’s to the next million! Bigger, wordier, and more tower-y: Word Tower has been released. 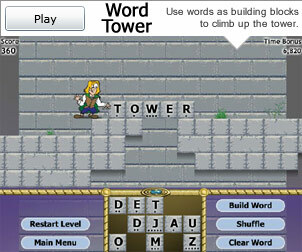 Word Tower is medieval word-adventure game. Use words as building blocks to climb up and the towers and rescue your Princess! You can play it here on No Fail Games. It’s also available on Kongregate and Newgrounds. If you play there, give it a few votes too! Special thanks to our sponsor, King.com. While the blog hasn’t seen much activity, the games have. After not finding a sponsor for awhile, I went ahead and released Word Minute to the general public through Mochi’s distribution. 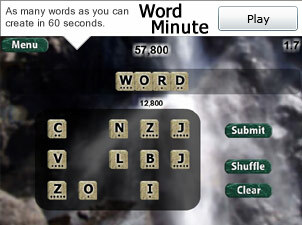 Word Minute is a fun, simple, quick (exactly one minute) game where you just spell words to get points and attain a high score. 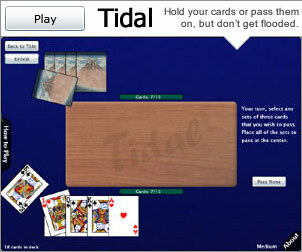 Tidal is now available to play on Silver Arcade. Tidal is now available to play on Mashooo.com. It’s also part of the S Prize contest, so log in and give it a good rating. I made a little bug fix with set identification in Tidal and have updated it to version 1.01. I’ve cleaned up the bugs in Tidal, and have made it generally available. Give it a try, feel free to leave comments with your thoughts about it. I’ve decided to unleash Tidal to the general populace in beta form while I find and work out some of the bugs. Note that beta may mean full-of-fail, so post to the comments any bugs that you find. Post a comment if you like it as well. Click here to play. Look, a logo, a blog, a theme. Well, actually, I’ve had the logo for a little while… but now there’s somewhere to post it.